Like every bad poker player, Donald Trump has a tell, and he’s completely unwilling or unable to hide it. When he starts ranting and raving on Twitter at all hours of the day and night, as opposed to just his usual early morning meltdowns, it means he thinks (or knows) that something rather ugly for him about to surface. This weekend has been one of Trump’s most whacked rant-fests to date – and somewhere in there, he gave away something specific. Donald Trump tends to do less tweeting on Saturday than any other day. But yesterday he couldn’t stop tweeting. He started the day with a loveletter to murderous dictator Kim Jong Un, and then he went on to attack everyone from Hillary Clinton, to the FBI, to Congress, to immigrants, to the New York Times, to the Mayor of Oakland. Trump’s ranting couldn’t have been any more maniacal. At one point he stated that the New York Times will be out of business within six years, before making up a phony story about how the newspaper apologized to him for the negative coverage it gave him during the 2016 election. At another point he characterized immigrants as being “Gang Members, Drug Dealers, Human Traffickers, and Criminals of all shapes, sizes and kinds.” But really, we think that description is more befitting of his own cabinet. 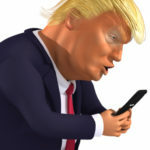 However, the real upshot of Donald Trump’s ranting was this tweet: “I never offered Pardons to Homeland Security Officials, never ordered anyone to close our Southern Border (although I have the absolute right to do so, and may if Mexico does not apprehend the illegals coming to our Border), and am not “frustrated.” It is all Fake & Corrupt News!” For weeks, Trump has been openly bragging about the laws he’s been breaking. But when it comes to this particular crime, Trump is insisting he didn’t do it. We think he recognizes that this is the kind of thing that could get him impeached and ousted. The more Trump rants the more we learn about what he fears most.